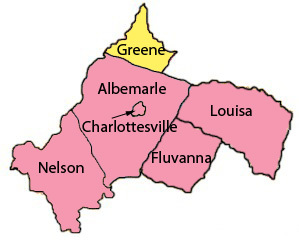 Greene County borders Albemarle County to the north. The county seat is Stanardsville. An article on Wikipedia has information about Greene County in areas beyond Albemarle County's borders. This section is a stub. You can help cvillepedia by expanding it. Greene County is a member of the Thomas Jefferson Planning District. ↑ Web. Brenda G. Garton Named Interim County Administrator, Press Release, NBC29, July 13, 2018, retrieved July 23, 2018. ↑ Web. Greene County Names New Administrator, Staff Reports, Daily Progress, World Media Enterprises, January 9, 2019, retrieved April 22, 2019. ↑ Web. U.S. Census Bureau Quick Facts for Greene County, U.S. Census, retrieved July 23, 2018. ↑ Web. , Terry Beigie, News Article, Greene County Record, September 27, 2018, retrieved October 4, 2018.